Christine Rose is obsessed with self-help guides and she owns shelves of books with titles such as How to Enjoy Your Life in Thirty Simple Ways and How to Quiet Your Mind and Get Some Sleep. But when she meets a stranger, Simon, in an abandoned building none of the self-help books she's read are of any use when she's trying to talk him out of taking his own life. Using the knowledge from her books as a guide she wills him to put down the gun in his hands but just when she thinks she's succeeded she ends up saying the wrong thing and he finishes what he came out there to do. Wrecked by guilt because she was unable to save Simon, Christine impulsively climbs up the Ha'Penny Bridge in Dublin when she sees someone else who is trying to take their own life. Desperate to not make the same mistake twice she makes a bargain with the man, Adam. If he comes down the bridge with her she promises that she can convince him that his life is worth living for. Reluctantly Adam accepts her offer but with one request of his own: Christine has to work with a deadline. He will listen to her for the next fourteen days but if in two week's time, when he turns 35, he still feels like he does now he will find a way to end his life. A book with a premise like that is bound to be a weeper, and it definitely is. However, it is so much more than that. I adore Cecelia Ahern's novels because she not only writes beautiful (love) stories but also because her novels have a hint of magic and the surreal to them, which elevates them above an average chick-lit. This one is no exception, as Christine running into suicidal people left and right is more than a mere coincidence. And even the names of the two main characters sounded a little fantastical, Christine Rose and Adam Basil could've walked straight out of a fairy tale. 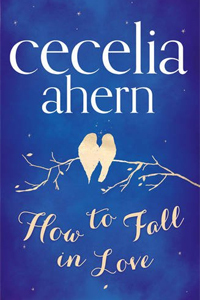 There were many things I loved about this novel: The way Cecelia Ahern started each chapter with a unique "How to..." title, Christine's own personal growth, the absolutely stunning cover (seriously, I'm a little bit in love with it) and of course Adam; what a tortured and beautiful character. It was very easy from a reader's point of view to be taken in by him but this made it only more difficult to continue reading, because with each turn of the page his birthday, and with that the looming deadline, crept closer and the risk of losing him forever increased. How to Fall in Love is a lump in your throat kind of novel, that's for sure, yet despite this it is also charming and amazingly inspiring, as it will make you appreciate the life that's given to you. It's the perfect book for anyone who loves meaningful and magical stories and for those who want to know how to fall in love. Just make sure you have a pack of tissues at hand when you start reading it, as you're going to need them. You can pre-orde your copy from Amazon.co.uk, Amazon.com, Waterstones or your own preferred retailer.